Many of us experience Age Spots, Skin Discolorations, Freckles, or some other blemish either by birth or environmentally that we’d like to get rid of. We have been looking for a unique type product that addresses this , and discovered a product called Ling Zhi Whitening Cream while we were in a Oriental shop in the Northern Virginia area. This product is popular in the Asian community, and is also heavily marketed to everyone all over on the Internet. We personally tried the product for a couple months among ourselves and sure enough freckles, and age spots faded significantly. The product felt smooth on the skin, and left the skin glowing. We actually were considering reccommending the product to others but first wanted to test this product before even considering to promote this product for the Salon. 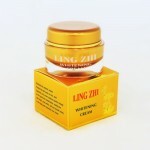 Ling Zhi Whitening Creme comes in an attractive gold box, the label claims it is made in Japan??? , the ingredients are not listed? Due to the many reports of the possibility of Mercury present in Whitening\Fading products like this,we ordered a home test kit by Osumex to test for Mercury and tested it ourselves. The product instantly tested positive for Mercury exceeding 2 ppm ( maximum on the color chart scale of the home test). These results indicated some Mercury was present, but did not tell us the actual amount of Mercury in this product. To obtain an exact amount, Cool Looks Salon decided to contract Microbac Lab services to do extensive Mercury tests on a sample of this product, so we sent them our sample in their mailer kit . About 5 days later we were E-Mailed an 8 page analysis document. The end results were deeply concerning!!! It was found that this sample contained 15,000 ppm or 1.5 % of the ingredients of this Whitening Cream was some kind of mercury compound. What makes these results so profound is the FDA prohibits the use of mercury in cosmetics and will only allow less than 1 part per million (0.0001 percent) To state it frankly this sample of product contained 15,000 times the amount legally permittted by the FDA! Mercury compounds are readily absorbed through the skin on topical application and tend to accumulate in the body. They may cause allergic reactions, skin irritation, or neurotoxic manifestations, and other issues. Mercury by itself, is known to hinder the appearance of blemishes by de-activating melanin production, but when the use stops, the blemishes will return to the state they were before. In short, if this sample truly represents an accurate assesment of this product, then we suggest to look for alternative much saferWhitening \ Fading products that are Mercury free! The labeling and jar kind of look the same to me, although I am surprised they actually now list ingredients. Unfortunately we can never be sure about products that are being produced overseas. I sincerely doubt this product comes from Japan since they like the US are very stringent in what can be placed in cosmetics. I suspect this is being produced in China where many harmful compunds are found in the product, and anything can be placed on the label. What is good age to use this cream? Thank you for your post. Actually our post was warning of the dangers of this propduct so in short we do not recommend the use of this product! There are other products on the market that do not contain dangerous levels of Mercury.